The new HP Deskjet Ink Advantage Ultra 4729 is designed for low-cost printing that is professional grade and good in quantity. It offers a glossy effect to the color prints by maintaining the accuracy of the color and brightness. This printer can be used both in the office and home. With the new HP Deskjet Ink Advantage Ultra 4729, you can get up to 1500 quality prints at a very low cost. Its ultra-high-yield Original HP Ink cartridges print thousands of pages at a very low cost. You can take prints from your smartphone and other smart devices. It ensures professional quality prints at a low cost. Apart from that, it produces borderless, lab-quality photos. It also creates laser-sharp documents easily. You can do multiple tasks, such as print, copy, scan or fax by using this printer. It comes equipped with these specifications: Cartridge Yield: 1,500 / 750 (Black / Colour) pages; Print speed of up to 7.5/5.5 ppm (ISO) (Black/Colour); HP Auto-Off Technology for energy saving; Unattended remote printing with enclosed output tray; and Printing and copying from an intuitive control panel and icon display. No return of items like Printers, inks, toners etc. if it is opened/seal broken/used (if you printed a single page also)/installed. Only Box pack items can be Returned with in 7 Days from the date of Dispatch. guarantee's warranty's as per Manufacturer's rules and regulations only. Register a email to Customer Care for Installation. (or by phone. we recommend by email. 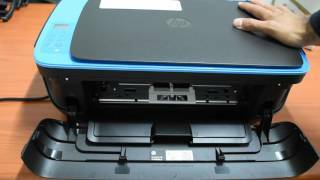 for HP Printers 18004254999 and for Epson 1800425 0011, for Canon-18001803366 ) Return Shipping charges should be bared by customer.